Two days left of this month and, because it is my little obsession, hours to vote in the first round of ArtPrize. It’s been a busy week which is my way of saying that I’m at a loss for time in the studio. Bridgette and I went to the Wexner Center for the Arts last Friday to see Guy Maddin’s new movie Keyhole and the next day I had to photograph installation work by Suzanne Silver. 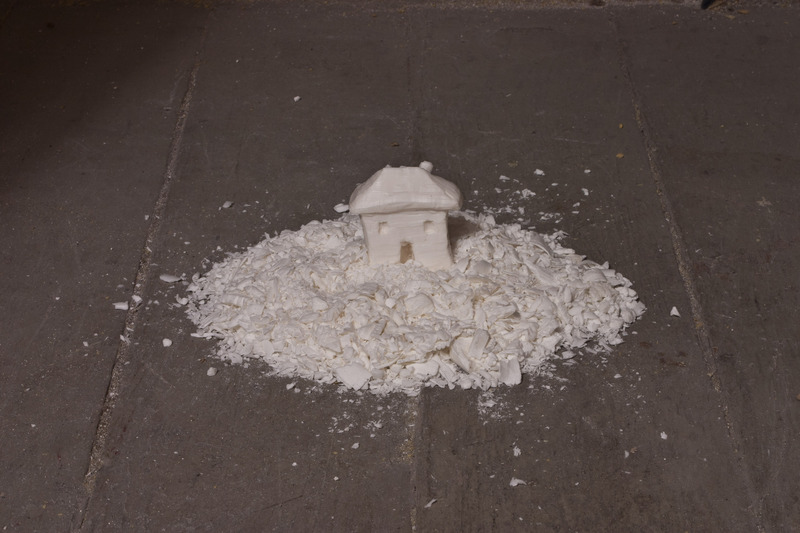 Now the funny thing is that usually there aren’t any happy coincidences but the Guy Maddin movie turned out to be the autobiography of a house and an installation Suzanne was working on in the Franklinton neighborhood near Columbus was in an old bare bones, abandoned house. Things I’m am working on that need to get to the printed image stage …the pinhole images of tree trunks to go along with the vandyke brown prints which make up the Forces of Nature and from walking projects. 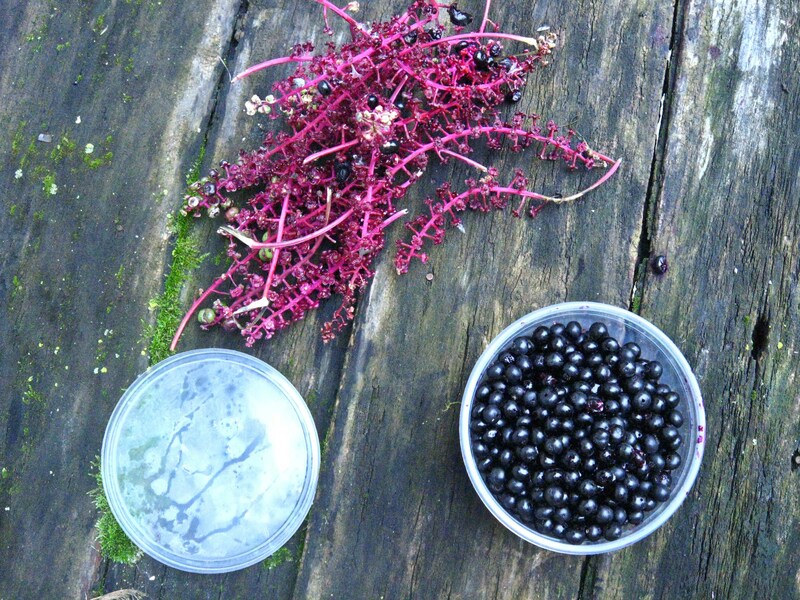 Additionally I have been picking pokeberries and getting some of them into emulsion form. More on that this weekend but let me say that Everclear is making a welcome appearance in the emulsion recipe. Thank you Nate Smyth for the grocery bag full of berries from your dad’s backyard. It must be the mother lode of pokeweed. Wednesday night I attended the Dayton Visual Arts Center annual meeting (for 2010 – 2011). The initial pull was a phone call from Patrick Mauk requesting my attendance to receive the Lombard award for apple which was the first place winner in the annual members show. These sorts of things don’t happen very often for any artist and it really is due to the hard work of Bridgette Bogle that I had any work in this exhibition. It was a chance to catch up with Tess Cortés (Netta Bits), Bruce Campbell, and Christina Pereyma who’s works were also honored on Wednesday. But it was also a chance to see Jane Black one last time in her capacity of Director of Dayton Visual Arts Center. In a few months she will be co-directing the Dayton Art Institute. It was also a chance meeting with retiring Board of Trustees Secretary Anne Johnson who has an unexpected connection to an artist that I strongly admire. 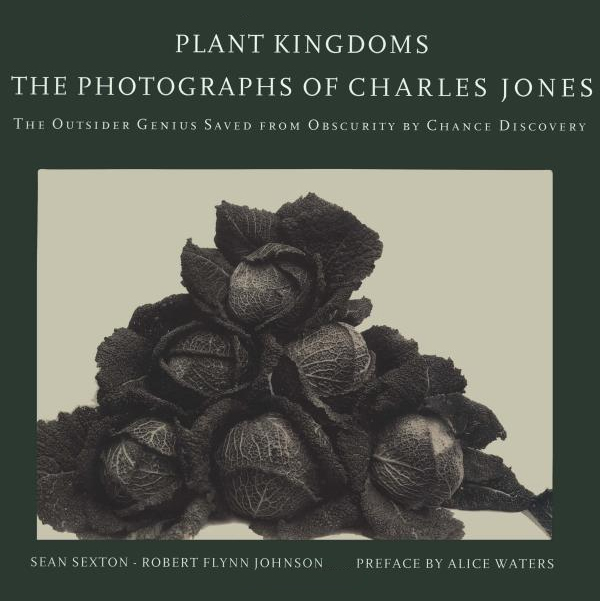 During the reception following the meeting, Alice spoke admiringly of apple and then proceeded to offer me a copy of Plant Kingdoms: the Photographs of Charles Jones. It turns out her nephew in San Francisco has some of the glass plate negatives produced by this turn of the century English gardner who never exhibited his photographs in his lifetime. Her nephew is also a co-author of this book. I can’t remember how I originally found this book but I believe I may have bought it in Half Price Books in Columbus. I was able to tell her that I did have a copy and that I did think that Charles Jones was an inspiration for my own approach to photography. Now I have two tasks: Locate this book amongst my disorganized shelves and look up her nephew the next time I am in the bay area (perhaps a two week visit to the Headlands Center for the Arts). 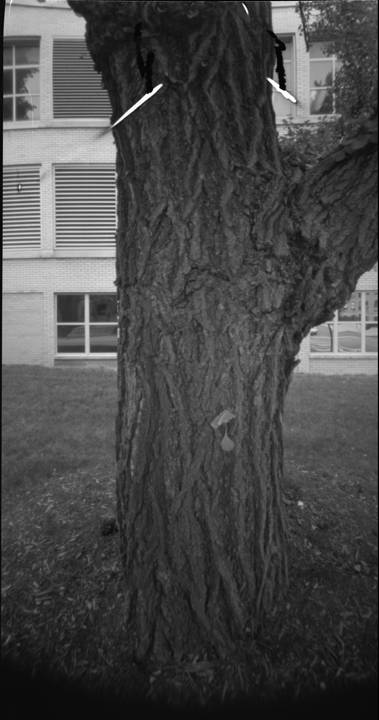 From last Wednesday afternoon while the alternative photo class at the University of Dayton was working with pinhole cameras I decided to try out a new one. 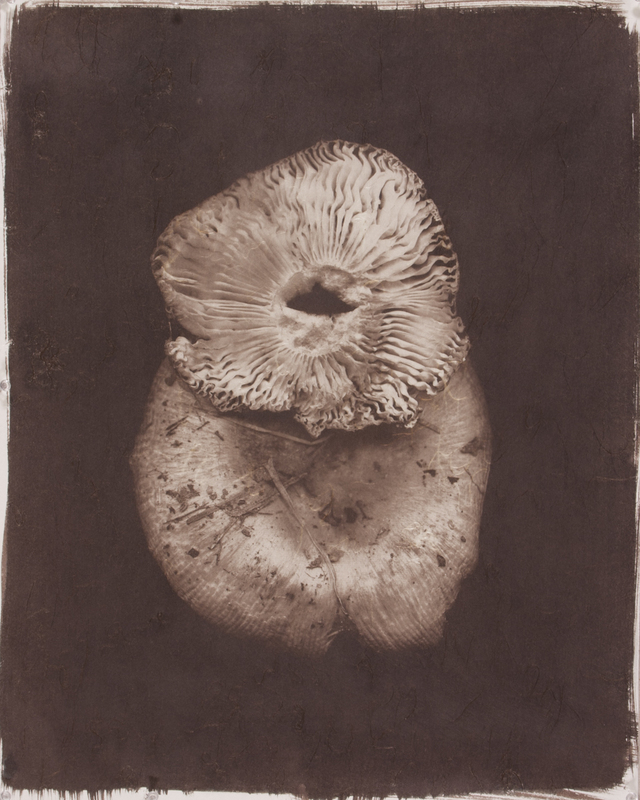 Pinhole will make an appearance in next fall’s “Naturalists” exhibition at Dayton Visual Arts Center. Here is the starting point, a test roll with a Holga 120 WPC. I may play around with the shutter, the shape of which I believe is causing the semicircular vignette at the bottom of the frame. A day of rest would be today after all the printing, framing, more printing, painting magnets, painting push pins, more printing, cutting, transporting. ArtPrize is the last of the fall exhibitions I had on the burner. Besides preparing for classes at the University of Dayton, I have been working on the following: the Artist in Residence at Emmanuel College exhibition, the Photographic Resource Center Auction (happening soon), Texas State University San Marcos (Wild Kingdom), Bowling Green’s Fresh: Ohio to the Faculty Exhibit at Sinclair College (I teach one class there) and ArtPrize 2011. It should be apparent I haven’t had a day off in a while. While I do have to pick up Bridgette’s work for the Rosewood gallery exhibition today, today is mostly free and I may actually get to some domestic duties. 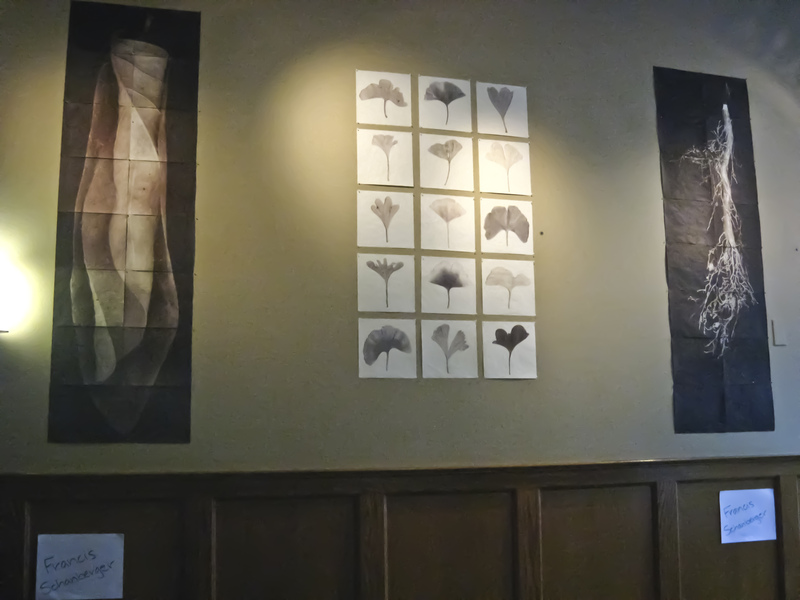 Up in Grand Rapids now to install work for ArtPrize 2011. Tomorrow, I”ll shoot a pic of the trunk full of art. The “from walking” pieces are very compact and very time consuming to install.What you might call a blessing and a curse. 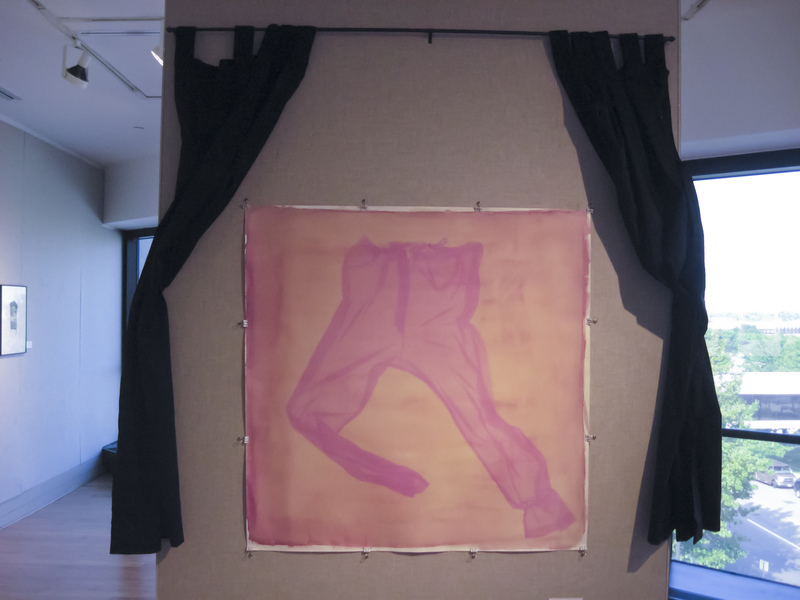 Here is an installation view, photographed by Bridgette Bogle, of Rose Red Pajama Pants which is on view at Sinclair Community College’s Triangle Gallery. 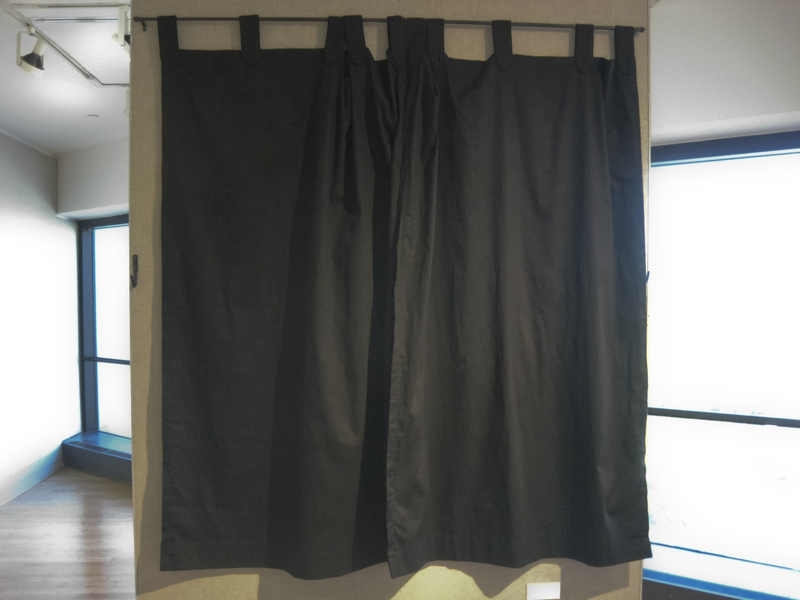 It is on view “sometimes”, if one is willing to open the black curtains. This is an idea I appropriated from a traveling exhibition of William Henry Fox Talbot’s Callotypes and paper negatives on view at the Museum of Photographic Arts in the late 1990’s. There are hooks on either side to keep the curtains open so that viewers can step back from the work to get a proper view. In borrowing the Chinese proverb “the faintest ink is more powerful than the best memory, I will substitute fugitive or transient. Given enough time and exposure, these transient pigments will become the faintest of inks and may then be hardly better than the best memory.